2018 · Clash of Civilisations? Where are we now? The program was convened by Professor Bronwen Neil FAHA and Profressor Catriona Mackenzie FAHA both of Macquarie University. Twenty-five years ago, American political scientist Samuel P. Huntington posited the question ‘The Clash of Civilisations?’ suggesting religious and cultural identity would be the primary source of conflict in the post-Cold War era (Foreign Affairs, 1993). He predicted that, as the West began to develop a better understanding of the cultural fundamentals underlying other civilisations, Western civilization and its values would cease to be regarded as ‘universal’. This has certainly proved to be the case. 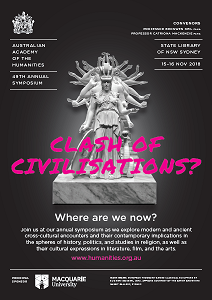 The Symposium will reassess Huntington’s question, in light of recent global developments and historical inquiries, and consider how the concept of ‘the clash of civilisations’ has been used as an enduring rhetorical device for explaining divisions between groups and across time and place. It will explore modern and ancient cross-cultural encounters and their contemporary implications in the spheres of history, politics, and religion, as well as their cultural expressions in literature, film, and the arts. Cliff Goddard (Griffith University) — ‘Civilisation’ and Other Meta-categories: How they work and how to do without them. Cris Townley (UNSW) — Cross Cultural Encounters in Playgroups: Spaces of belonging, support and identity and recent article Playgroups: Moving in from the margins of history, policy and feminism. Georgia Curran (University of Sydney) — Cross-cultural negotiation in the production a Warlpiri women’s yawulyu DVD and see the Warlpiri women’s songs from Yuendumu website for more details on the project. Roland Boer (Renmin University of China, Beijing) — ‘We have freedom of religion!’ Understanding Chinese Marxists Approaches to Human Rights and pre-publication chapter Sovereignty and Human Rights: A Comparison between the Western European and Chinese Marxist Traditions. The 49th Academy Lecture — Turning the Level of Civilisation Up: The twenty-first century challenge — was presented by Honorary Fellow Professor Julianne Schultz AM FAHA. An excerpt of the lecture has been published in The Conversation and the audio recording and video are available. The 8th Hancock Lecture — Hybrid civilisations or Clash of civilisations? : Re-visiting the Muslim Other — was given by early career Arab and Islamic Studies scholar, Dr Raihan Ismail. The audio recording and video are available. Edited versions will feature in Humanities Australia No. 10. The program was convened by Professor Susan Broomhall FAHA (The University of Western Australia), Professor Alan Dench FAHA (Curtin University), Professor Jane Lydon FAHA (The University of Western Australia), and Professor Baden Offord (Curtin University). Read their reflections on the Symposium. Over the last decade, there has been an explosion of interest in the history of human rights, linked to critique of its current global formations. The long history of human rights has been shaped by the ideas of humanism, conflicts for religious freedoms and political representations, and colonial engagement that provokes debates about universal humanity and inviolable rights. How is contemporary Australia shaped by these long intellectual and emotional histories regarding human rights and humanitarianism? Can we identify a distinctively Australian perspective on these questions? What are the challenges for Australia today in engaging with human rights related to matters as wide-ranging as sexuality, disability activism, Indigenous rights, linguistic imperialism, refugees, and religious freedoms. Select presentations and additional related works by speakers are available below. Convened by Professor Peta Tait FAHA and Professor Nick Bisley and supported by an advisory group including Professor John Makeham FAHA, Dr Tseen Khoo and Professor John Fitzgerald FAHA. 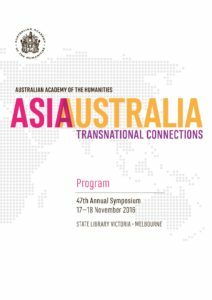 The Australian Academy of the Humanities’ 47th Annual Symposium explored the array of transnational linkages between Australia and Asia. Few would question that Australia’s future will be profoundly shaped by economic, social and cultural developments in Asia. Yet there has been insufficient attention to the ways in which the already rich, diverse and vibrant transnational connections bind Australia with Asia. Understanding the distinctive patterns of these connections, across the full spectrum of activity from the philosophical to cultural collaborations will be vital not only for making sense of our world but better shaping its future. Sponsored by La Trobe University (Principal Sponsor), Australian Council of Learned Academies, RMIT University, Australia Policy Online, Swinburne University of Technology, Monash University, and the University of Melbourne. Convened by Dr Robin Torrence FAHA and Dr Anne Clarke. 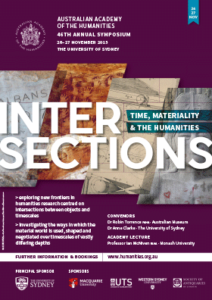 The Symposium explored new frontiers in humanities research centred on intersections between objects and timescales. Scholars from across various disciplines investigated the ways in which the material world is used, shaped and negotiated over timescales of vastly differing depths. Expanding beyond texts and visual media, materiality also encompasses memories, objects and landscapes. Histories that draw on this broader palette offer new means of envisioning the past, including novel conceptions about ‘Deep Time’ or ‘Big History’. The Symposium addressed a wide range of perspectives on time and materiality in the fields of art practice, cultural studies, philosophy, history, linguistics, heritage, and archaeology. The intersections between these varied perspectives provided a forum for productive discussion and debate. Sponsored by the University of Sydney (Principal Sponsor), Macquarie University, the University of Technology Sydney, Western Sydney University, and the Society of Antiquaries of London. Convened by Professor Kate Burridge FAHA, Associate Professor John Kinder FAHA and Emeritus Professor Pam Peters FAHA. 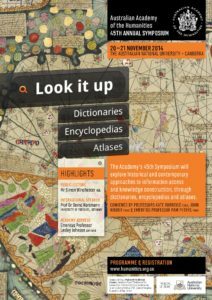 The Symposium explored historical and contemporary approaches to information access and knowledge construction, through dictionaries, encyclopedias and atlases. It demonstrated how the traditional print formats are increasingly used as online interfaces to multimodal, multifaceted information, suggesting new ways to understand the known world and supporting fresh kinds of research. The program showcased the work of Australian and international scholars in linguistic atlases, cultural encyclopedias and multimodal dictionaries, which not only transcend the boundaries between the traditional formats, but provide a vehicle for many interdisciplinary ventures within humanities and beyond. Sponsored by the Australian National University. Convened by Professors Gay Hawkins FAHA and Peter Harrison FAHA. What is the nature of nature? The sciences and humanities have wrestled with this question for centuries, and the variety of answers are testament to how promiscuous and elusive the concept of nature is. In recent years the urgency of this question has intensified as we are confronted with increasing environmental crises and losses. From climate change to species extinction nature presents significant material, social and intellectual challenges. The humanities have responded to these challenges with vigour and the recent growth of innovative work under the rubric of the environmental humanities is evidence of this. This new work builds on a long history of humanities scholarship that has highlighted the ways in which nature is entangled with culture. From romanticism to natural philosophy the humanities have played a key role in understandings of natural environments and their diverse relations to the social. 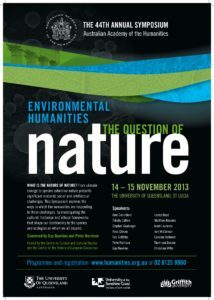 What is distinctive about the contemporary environmental humanities is the ways in which this work is engaging with and enriching scientific analyses of nature. Jointly sponsored by the Centre for Critical and Cultural Studies and the Centre for the History of European Discourses at The University of Queensland. Convened by Professor Tony Bennett FAHA. The Academy’s 43rd Annual Symposium debated the contemporary challenges that face the humanities and the challenging responses that these have elicited. The humanities are currently presented with a rare combination of intellectual challenges: changing policy environments and priorities necessitate new styles of thought and intervention; the still-unfolding financial crises urges a rethink of the economy and the interdisciplinary issues at stake in its investigation; there is increasing emphasis on the role played by material forces – technologies and infrastructures – in organising social life; and new cross-disciplinary concerns have been prompted by post-humanist perspectives and the environmental challenges presented by the conception of the anthropocene. The humanities have responded vigorously to these changing contexts. New paradigms for critical thought and its modes of social and political engagement have resulted in significant challenges to purely scientific, technocratic or economistic framings of policy challenges and solutions. Significant theoretical innovations and new research orientations have illuminated the role of ‘things’ in social life while also rethinking the concepts of matter and materialism. Humanities scholarship has brought new light to bear on the ways in which the human is always shaped by its relations to the nonhuman in its environmental, technical and animal forms. The increasingly prominent role of Indigenous perspectives in Australian intellectual life has prompted widespread recognition of the relevance of Indigenous knowledges to the practices of Australian universities. Sponsored by University of Western Sydney’s Institute for Culture and Society. Convened by Professor Joseph Lo Bianco AM FAHA. 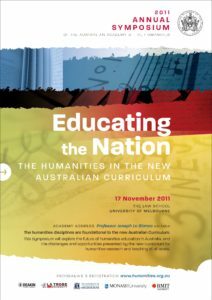 The humanities disciplines are foundational to the new Australian Curriculum. The Academy’s 42nd Annual Symposium explored the future of humanities education in Australia, and the challenges and opportunities presented by the new curriculum for humanities research and teaching at all levels. What experience of the humanities is envisaged for our future citizens? What interest in the humanities will be stimulated among Australia’s young people? 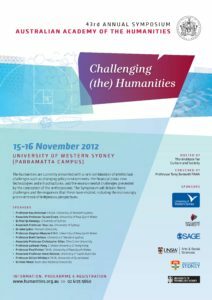 What skills will they bring to university, further training or the workforce from the disciplines, and the discipline, of the humanities?Who are Australia’s future scholars, researchers and teachers in all the disciplines of the humanities, and what encouragement is being offered to them to pursue a widely based and rich encounter with human knowledge. How has the Australian nation been formed through schooling and how does this compare internationally? Sponsored by the University of Melbourne (Principal Sponsor), RMIT University, Deakin University, Monash University, and La Trobe University. Convened by Professor Tim Murray FAHA. Cultural institutions play a vital role in building understanding and dialogue. They both enable and draw from the rich research by Australia’s humanities researchers into our own history and culture, and that of other nations and peoples. 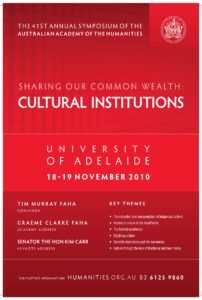 Key themes of the 2010 Symposium included issues surrounding the collection and representation of indigenous culture; access to culture of the Asia-Pacific region; festivals as cultural institutions; new developments in accessing culture and heritage in the digital age; scientific institutions and the humanities and access to culture through traditional and new forms of media. Sponsored by the University of Adelaide.